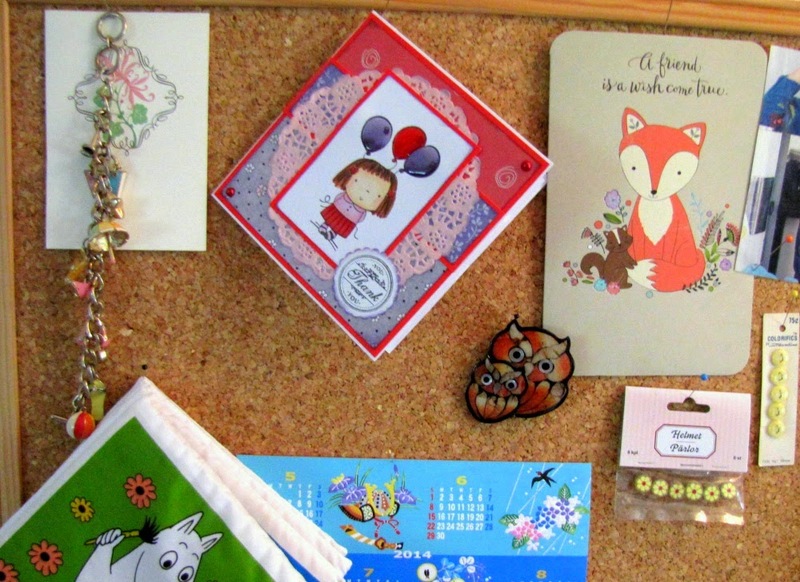 I just updated my inspiration board a little, somehow felt that the most summery things should go, and look: autumn has arrived into my creative place too. There are more darker colors, and it seems that I am getting more and more exited by all sort of finer crafts, cross stitch and fair isle knitting. Too bad I am not mastering either, but for inspiration they work wonderfully. And before you ask, no, the handicraft sampler is not my doing but my moms. If you ask her it was a very long time ago but if I had to guess, I would date that to somewhere in the end of 50s. The other make-me-smile piece there is a hemp pouch done with my dear friend, very whimsical and quite me. And you know, colors always work for me. 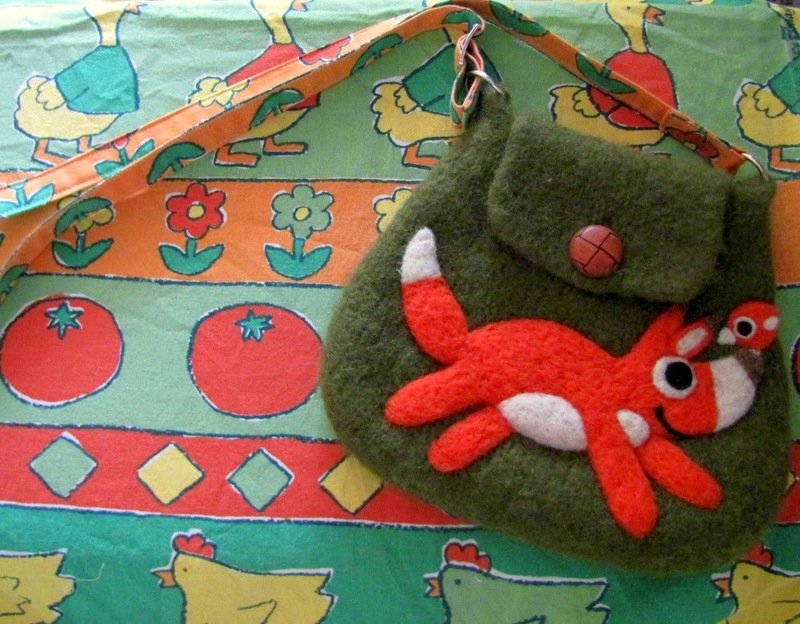 A fox-bag was born! A little, carry-just-your-essentials-one with a bright, adjustable trap. Definitely a bit autumn-ish yet still with a glimpse of sun and feel of summer there. A happy little bag! And speaking of the inspiration I still once would love to get back to this happy blog hop, and gather here all the wonderful posts my dear nominees wrote. They really did a wonderful job, and if you are looking for some inspiration to your Thursday, please head to: Nova's, Vivienne's, Anne's and Teje's and you'll be smiling in no time. Thank you still once ladies! P.S. I just started to wander in Instagram wonderland the other day, and I am there instagram.com/handmadebymia and even there is not that much to see yet, I am sure many things will appear there soon. Are you there? If so, please let me know and we can meet there too! Lots of lovely colour on your board Mia. 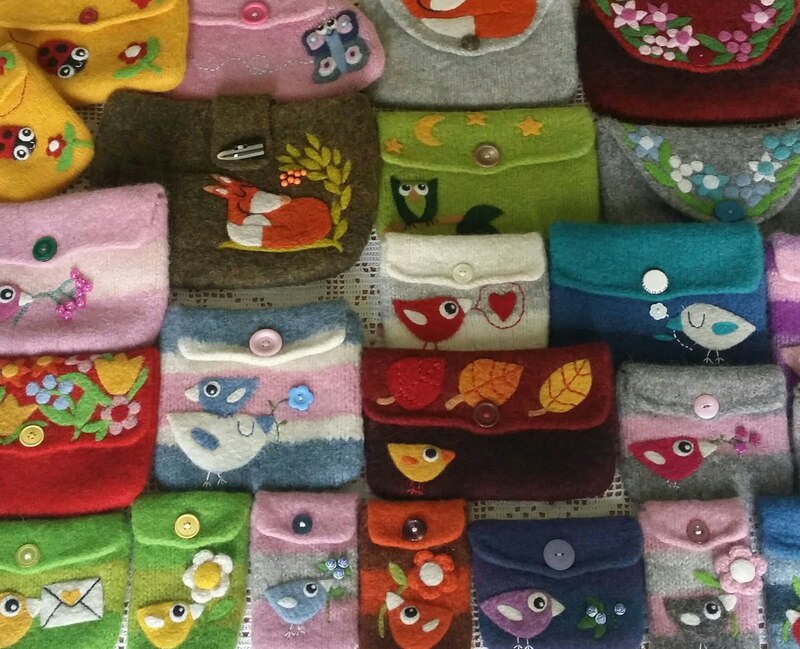 Your little foxy bag is gorgeous, I do love foxes! Thanks again lovely lady for the blog hop nomination! Thank you Mia!! I love seeing inspiration boards and yours is fantastic. I'm next to try out Instagram. Thank you - I love that piece too (and wish I could make similar but nooo - with my fruit fly patience). Thank YOU for the happy hop! Lovely day, and happy weekend soon too! Even it was hard to admit that autumn is almost here it was also great to put together some darker, richer tones on my board. I am so BAD with Instagram, but as I have a new phone&camera there I just HAVE to get it working...So I wish to see you there soon! Thank you - how is your move going, are you still living out of boxes (I am just tossing the last ones, it has been over a year!)? 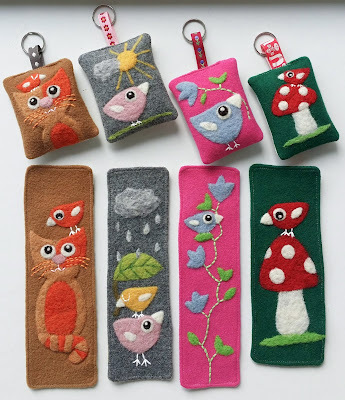 I wish everything goes smoothly, and you will have a new, happy crafting corner set up soon! Thank you for showing your inspiration boards. It was fun. I like Instagram. I think I will sign up. 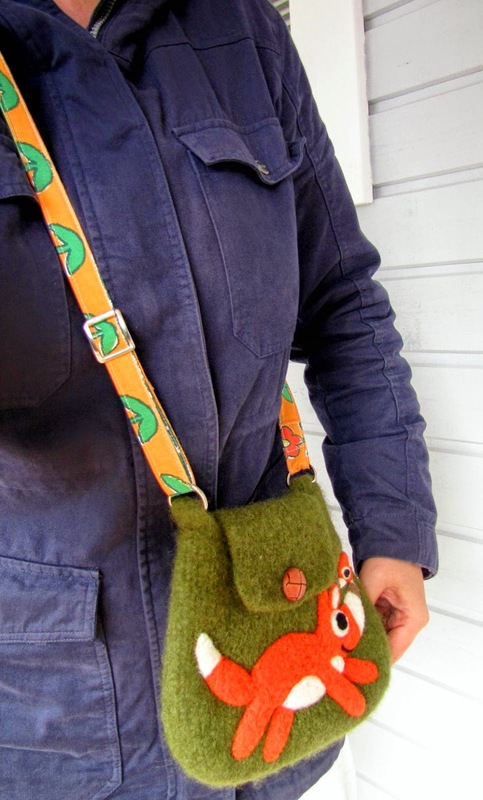 Mr. Fox bag is really cute. Love the colors. Let's enjoy the rest of August. Mr. Fox is sending you many greetings :) and thanking you for the inspiration! And oh it would be lovely to see your Instagram pictures too, your garden would have so many things I would like to see! Have a lovely weekend soon! 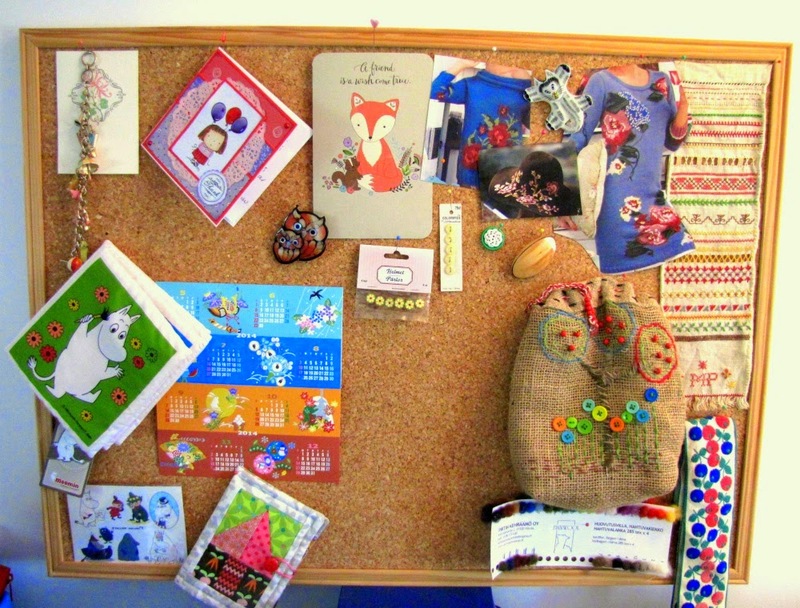 Ahhhh my dear Mia I love your Inspiration board, could do with some of your inspiration too ...do you have any to spare ? All my craft stuff is in boxes as we have no spare room, two grown up sons still living at home means no Craft room ! 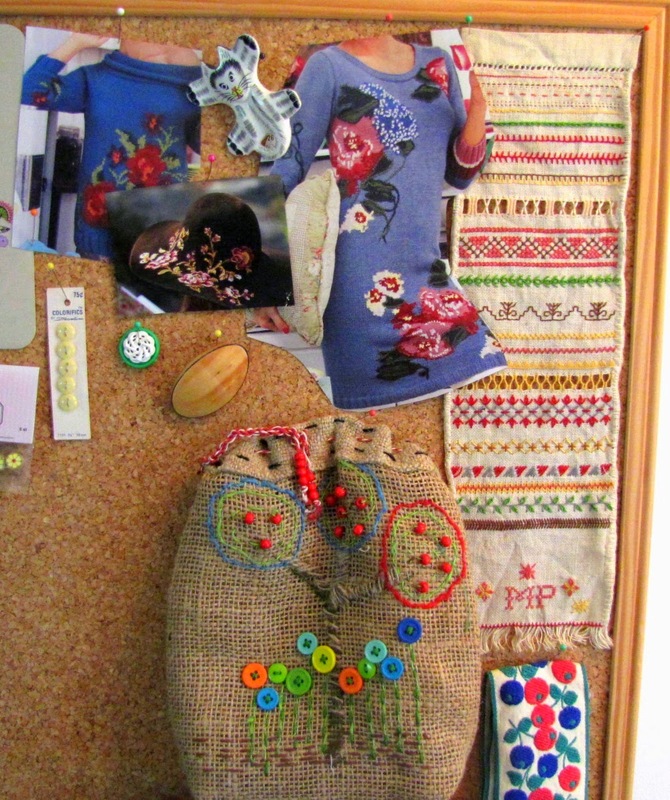 Loved seeing your colourful inspiration board Mia! The embroidery looks interesting, and your cards and stickers too. The little foxy bag is adorable. I have a lot of inspiration, and I am sending some happy thoughts&sunshine your way as I type :) And I know how you feel, my last "craft room" was the other end of our bedroom! Thank you! I would love to make some embroidery, but... I am just admiring others (like yours!) beautiful work! Autumn seems to be a great time for change - and what better way to start than your moodboard? I am also dreaming of a new desk, congrats for yours! Happy last days of September!